The name of this product pretty much says it all; it’s a deep cleaning charcoal face mask that is supposed to help open clogged pores up. 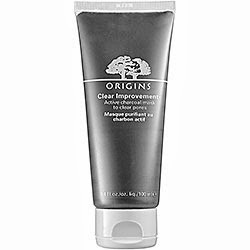 ORIGINS is known as a brand that uses a lot of natural ingredients so it’s safe to use on sensitive skin. This was my first time experimenting with the brand and I have to say I am IMPRESSED. At the same time of this I also asked for a sample of GlamGlow SuperMud Clearing Treatment and to be quite honest I noticed similar results. The ORIGINS mask retails at Sephora for $28 CAD which is less than half the price of the GlamGlow one that retails at $69. Now don’t get me wrong I think that the GlamGlow one is amazing, I love how I can see where the dirt’s being extracted from and my skin always looks great after it’s removed but I found that the ORIGINS mask worked great as well (plus it fits within my student budget). To get the same great results I found it best to put the mask on either directly after I exit the shower when my pores have been opened or to directly steam my face over a bowl of hot water. This allows the charcoal mask to easily clear out all your clogged pores and start the healing process faster. The mask is in a squeeze bottle which is great because I think it’s more sanitary and a little product goes a long way. It goes on a dark grey/blackish colour and dries to a lighter grey. There is a light fragrance to the product but I don’t mind it, I actually love the smell. I leave it on roughly 10-15 minutes or until it completely dries and then I wash it off gently with warm water and follow up with my toner, serum, eye cream and moisturizer. This mask has saved me a few times when I saw a new acne spot coming. I chose to try out the steam and mask combination before bed and when I woke up I barely even noticed a dot there anymore because it had jump started the healing process on it. This is my go to mask when I feel like my skin is in a really bad state and is in need of a makeover. I planned my busy week around when I am going to make a run to the Sephora in my area to pick up some of this mask. It's homecoming weekend coming up so I can guarantee on Sunday I will need a serious deep clean mask to clear up the poor food and drink choices I made. I think this product is definitely worth the $28 price tag it has because as I mentioned before you really don’t need a lot and it really does clear your pores. I have tried so many different face masks over my life that I can really tell when a product is a stand out one. I would recommend this product to anyone who wants a mask that will deep clean their pores – especially those with acne prone and oily skin. What are some of your favourite masks to pamper your skin with?